“My hope for us, the community, is that Our Lady of Guadeloupe brings us together,” Monsignor Busin said. “Because we are from different countries and cultures, we hope through our differences we can make a bigger Church and a happy Church. “That is the main reason for this festival today, we share our faith, our culture and our love for Mary. The festival celebrates Latin American Catholic culture in Sydney and honours Our Lady of Guadalupe, Patroness of the Americas. It brings together Sydney’s Spanish–speaking Catholic communities from South American countries such as Argentina, Mexico, Uruguay, Chile and Colombia. 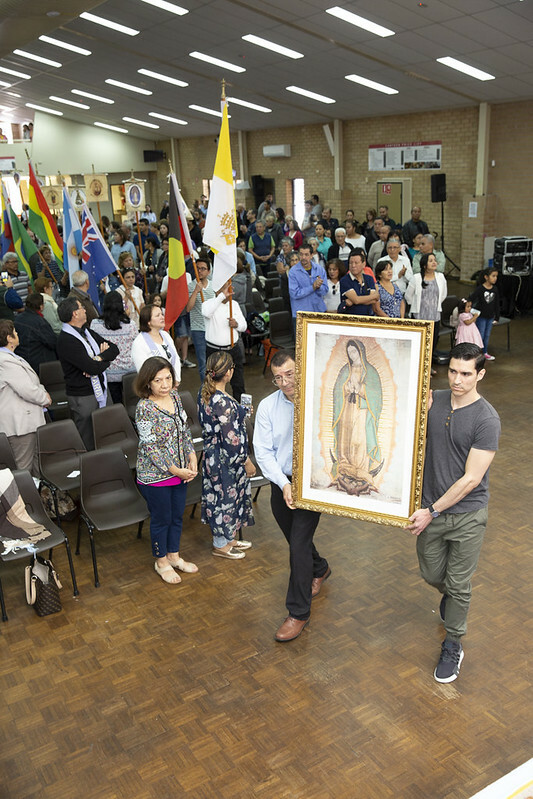 This festival is the most important Hispanic Catholic event in Sydney and according to Monsignor Busin, the festival brings Latin American “culture” and “happiness” to the Australian Catholic Church. “We want to share what we bring to Australia, we are part of this culture and we are one Church. A Solemn Rosary, led by Bishop Busin, was held at 9:30am followed by a 10:30am Mass celebrated at Good Shepherd Parish. Local clergy concelebrated the Mass, including Fr Luis Herrera, Chaplain to the Spanish–speaking community in the Diocese of Parramatta. “It’s the only day in New South Wales where Spanish-speaking communities come together to celebrate and honour the Virgin Mary,” Sonia, a native of Colombia, said. “The Mass is the best part of the day, it’s a special one-off, with all our communities celebrating Mass together,” Fermin Alonso said. Fermin, a native of El Salvador, is a parishioner at Good Shepherd Parish, Plumpton and a coordinator of the Spanish Catholic Community. He also helped organise the event. Following Mass, an immense array of traditional Latin American food was enjoyed by the gathering. This was followed with an impressive display of traditional music, dancing and a flag procession. “After the Holy Mass, we had artistic shows from our countries as well, with different groups dancing and singing, celebrating their own countries. We got to see how unique their cultures are,” Fermin said. Colombian–born Fr Luis was “very happy” to again be hosting the festival. “This is the second year we hold it in the Diocese of Parramatta. It has been running for about 15 years now,” Fr Luis said, pointing out it was previously held in the Archdiocese of Sydney. “The bishop spoke about helping us keep our faith alive and to remain strong to overcome tragedies in Latin America and pray for our brothers and sisters who are going through tough times in Latin America. “This is a lucky country Australia, we are so grateful for this country,” Fermin said. Monsignor Busin at the festival. Image: Diocese of Parramatta. Monsignor Busin was also thankful and grateful to Australia. “I would like to say thank you to Australia, you opened your hearts and welcomed us. A singer at the festival. Image: Diocese of Parramatta. Fr Luis was delighted the various Latin American communities come together annually. “This is a good thing, it’s a beautiful event” Fr Luis said joyously. “We are a small community, but we have beautiful commitment and beautiful leaders. “This is the most important Hispanic event that brings us together. “Hispanics come from all parts of Sydney for this festival. Like Ryde, Mascot, and Western Sydney,” Fr Luis said. Coordinators for the festival were from Ashcroft, Fairfield, North Ryde, Hurstville, Dee Why and Plumpton. Fr Luis maintains the Spanish–speaking chaplaincy by organising prayer and social meetings. He also celebrates the Saturday Vigil Mass at Good Shepherd, Plumpton for Spanish speakers. Fermin is optimistic about hosting the festival again.